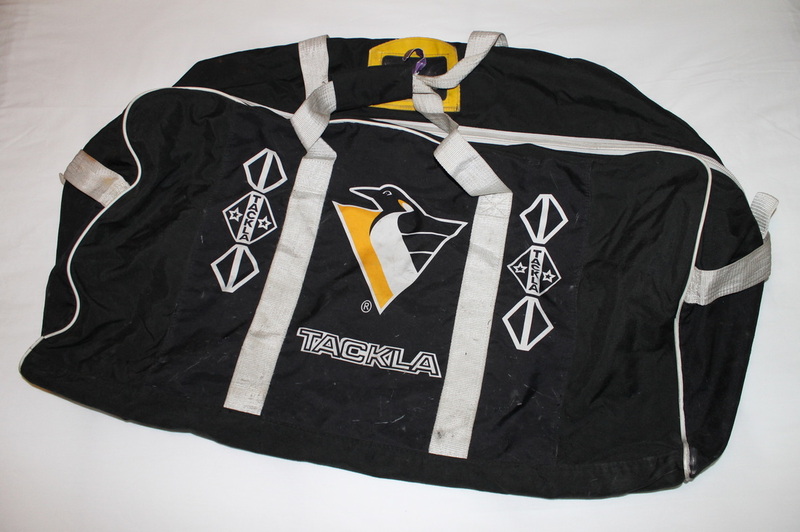 I was fortunate enough to be able to add this incredibly rare Penguins equipment bag to my collection, which is just oozing with eyeball appeal. 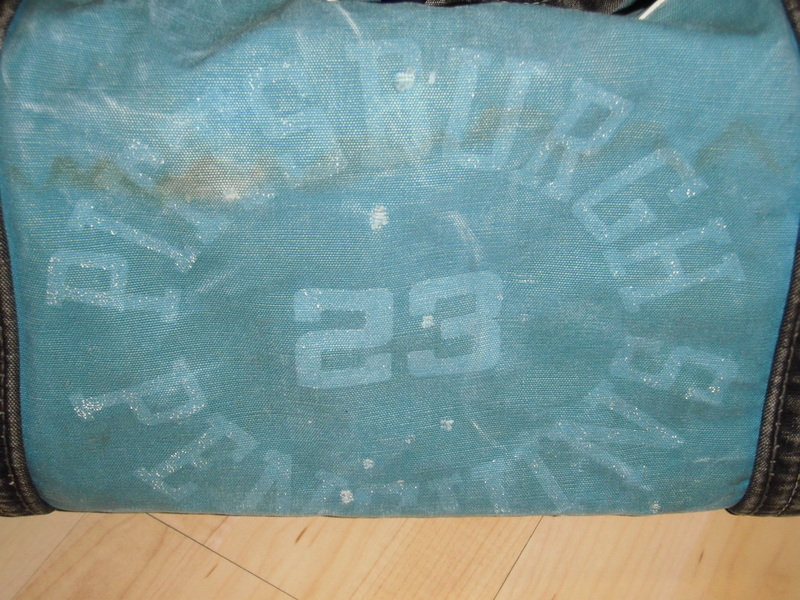 This one is by far the oldest of the bunch as I've learned it's a 68-69 bag that belonged to Doug Barrie. 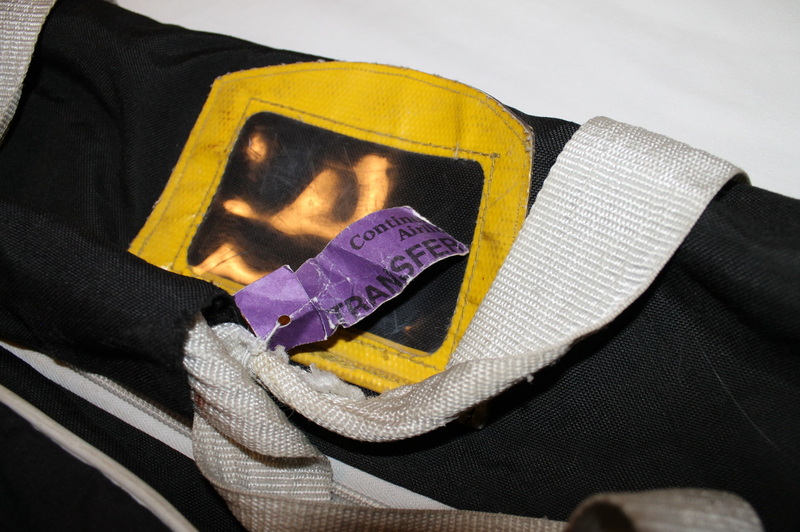 I surmise it belonged to Barrie as it came along with his shin guards (with "Barrie" marked in ballpoint pen) and a pair of game worn blue Penguins CCM gloves inside. 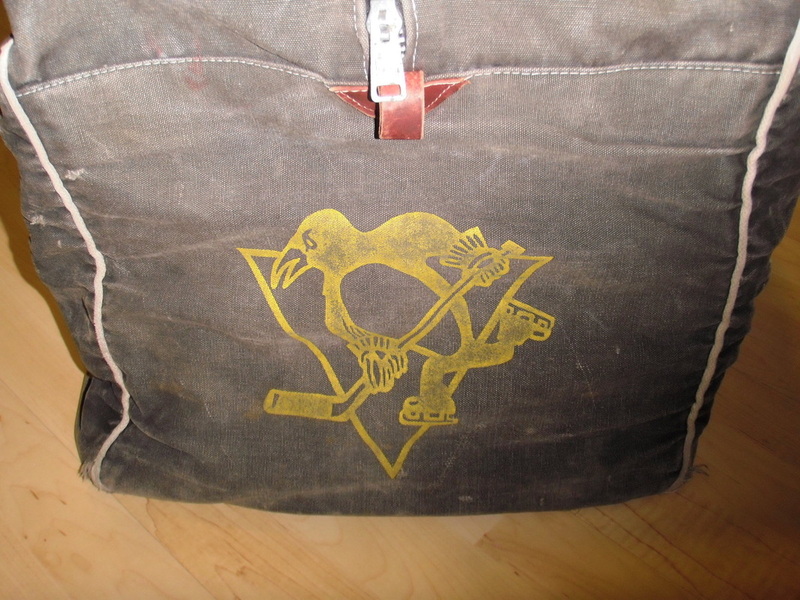 It's a Gerry Cosby bag with a the reminants of "PITTSBURGH PENGUINS 23" silkscreened in a circle on one side, and a '67 style skating Penguin patch on the other. 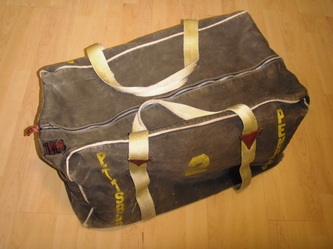 Barrie played only a handful of games in 68-69 and I suspect the bag is a 1st season that had been handed down to him. Displays extremely well and draws more attention than some of the jerseys in my collection. 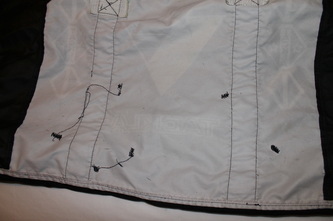 The bag has numerous cuts and abrasions, some of which are repaired, including a few which are fabric backed. Remarkably, both locking zippers still work perfectly, as a testament to the crafstmanship of a Gerry Cosby bag. 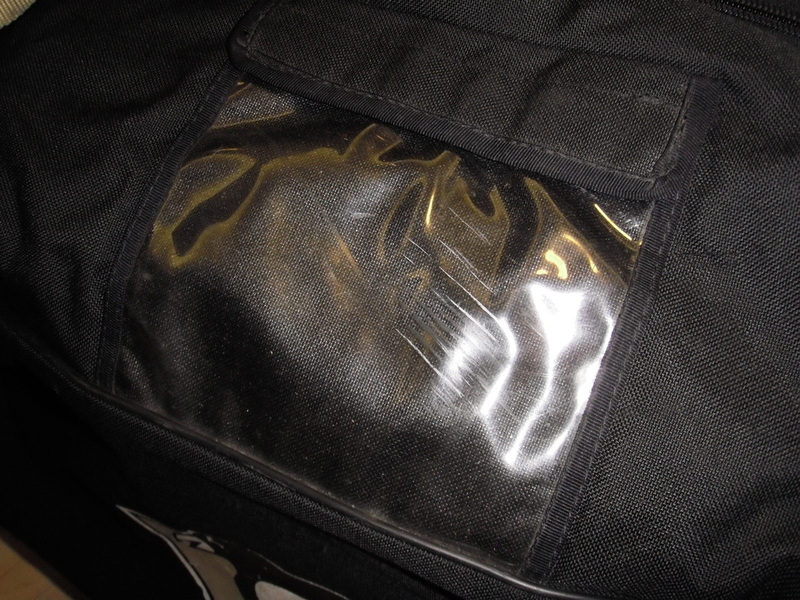 With the nylon piping and faux-leather corners, the bag on the whole has held up extremely well. I can only imagine the road trips this thing went on, and the historic dressing room floors it sat on. Obtained from a Pittsburgh Airport employee who got the bag from Kelly Wilson, adopted son of Penguin coach Johnny Wilson. Can't say I've ever seen another one like this. This heavy canvas bag is one of the first in the black and gold color scheme, and I suspect it dates to the early 1980s. 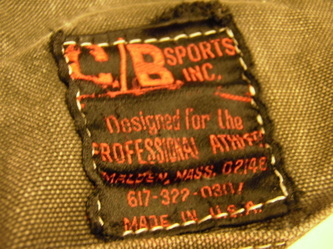 Made by C/B Sports of Malden, MA and is similar in construction to the more common Cosby bag. It features a wraparound nylon strap design that is reinforced with genuine leather gussets on the stress points as well as having leather pull tabs at the zipper ends. Silkscreened with a skating penguin logo on each end, and #2s on both sides, its an attractive style for sure. If only these things could talk about the places they've been and the cities they've seen. 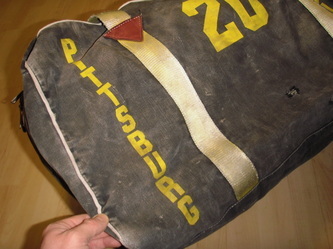 Interesting to note is the misspelling of "PITTSBURG" on the sides. Not terribly professional, but neither were the Pens back in those days. 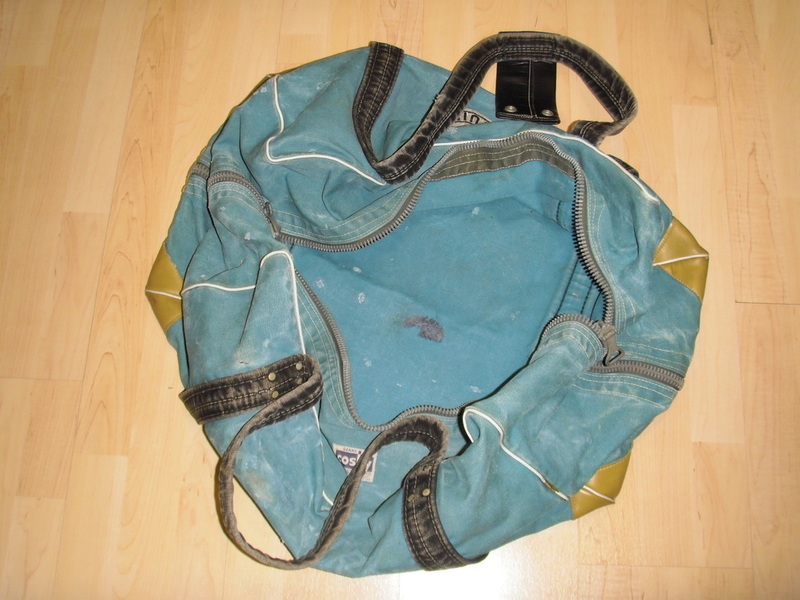 A fantastic example of an early 80s Pens C/B Sports canvas bag. 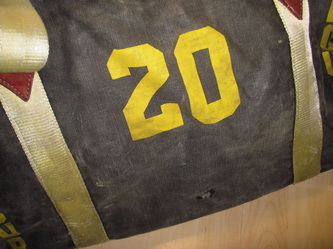 This one is Paul Gardner's #20 and it has many sewn repairs, some of which have additional fabric backing. 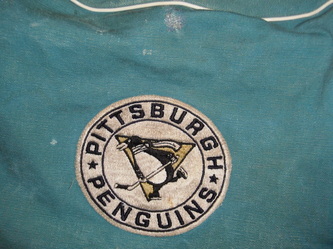 It has the" PITTSBURG" misspelling on both sides. Bold black & gold silkscreening remains on this one and it remains in overall outstanding condition. 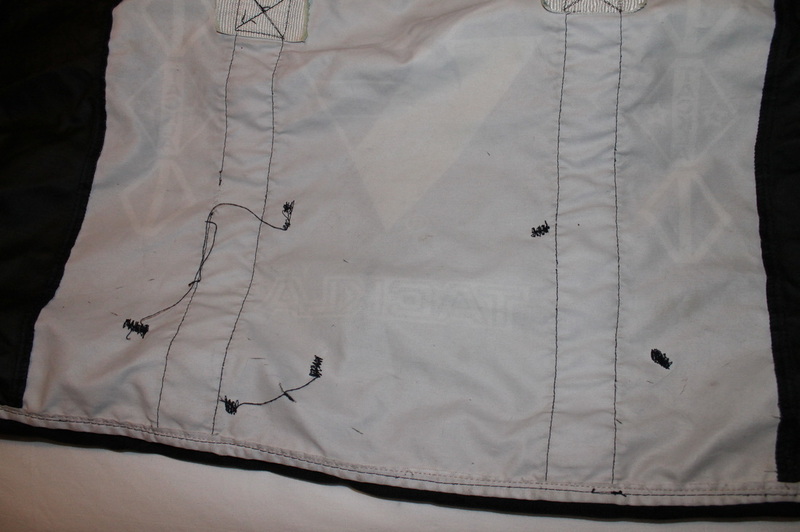 By the looks of the repairs it must have got kicked with skates a lot more than it got worn from repeated washings as the silkscreen remains particularly strong on this one. 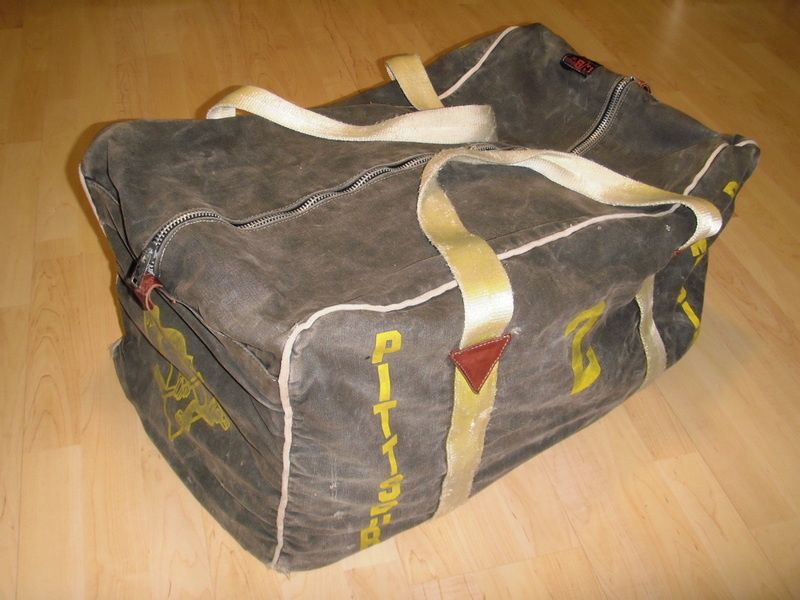 Old bags are really cool in my opinon, and carry all of the mystique of the old time hockey road trip. They make great display pieces and double as jersey storage so I try to buy any Pens ones I see being offered up. 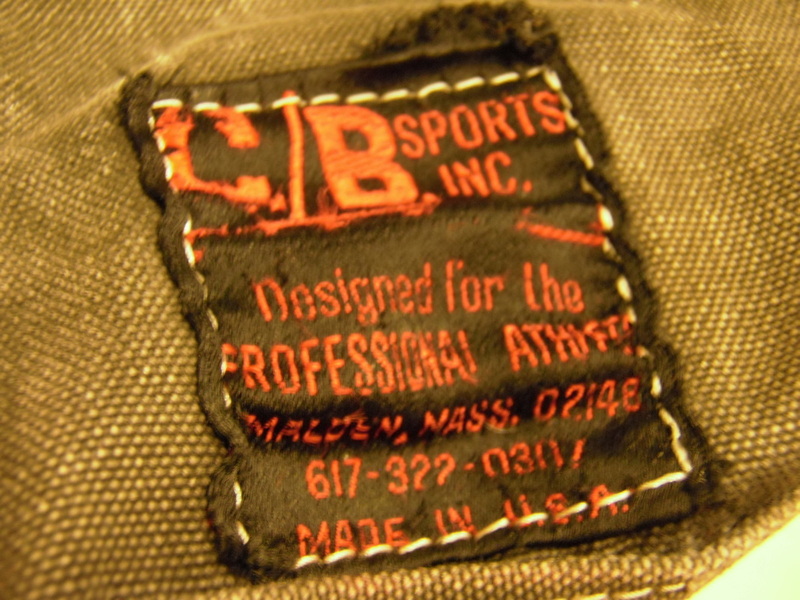 C/B Sports manufacturer's tag is nicely intact and perfectly legible. 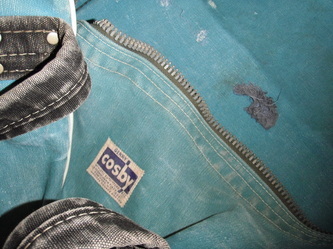 The original double zipper still works flawlessly while this bag exhibits double digit sewn and fabric backed repairs. A killer example from the Pens road trips of yesteryear. Dates to the very early 80s. 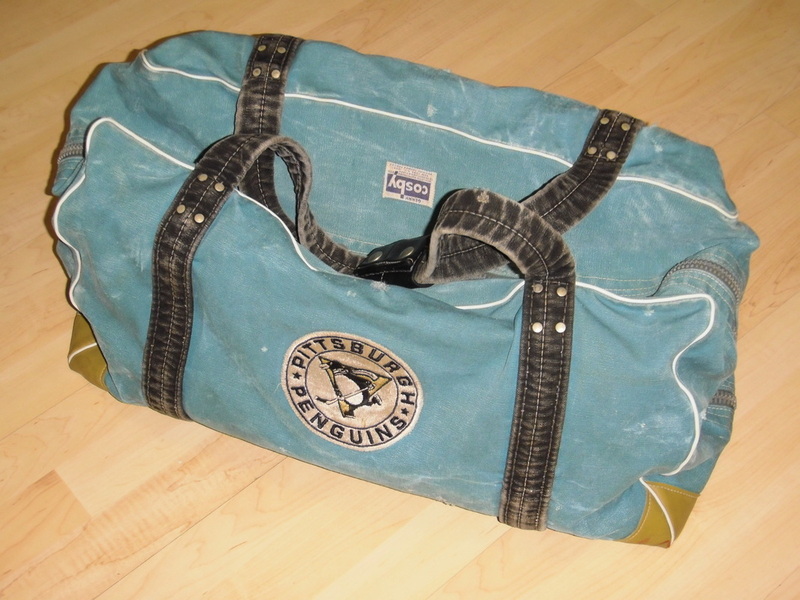 These same bags were also made in two tone blue for the late 70s Penguins, but I'm still looking to add one of those to my collection. 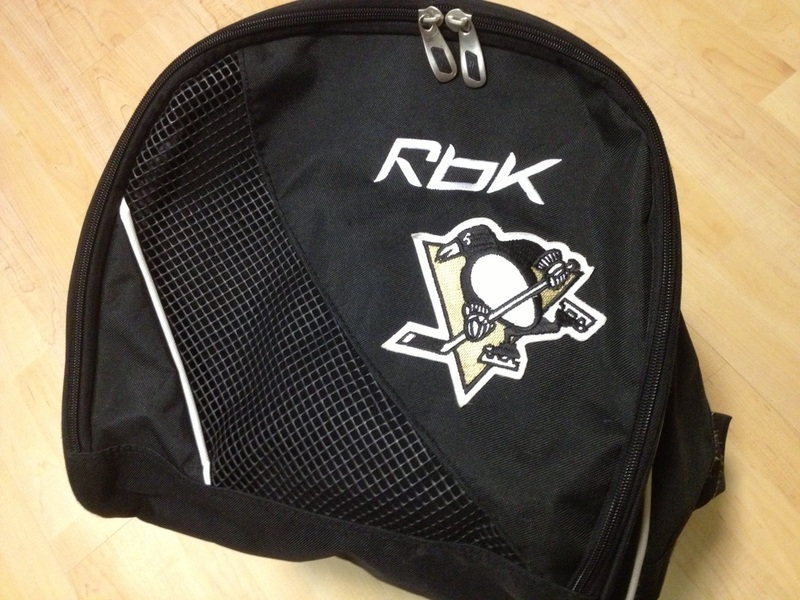 This midweight Tackla bag has sublimated corporate Penguin logos on both sides of the bag. 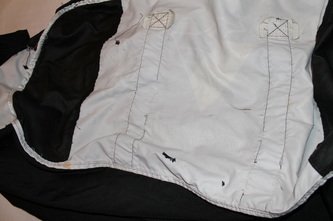 Separate skate pockets are present inside on both ends. Two way zipper with heavy metal pulls. Player ID window on the top as well. 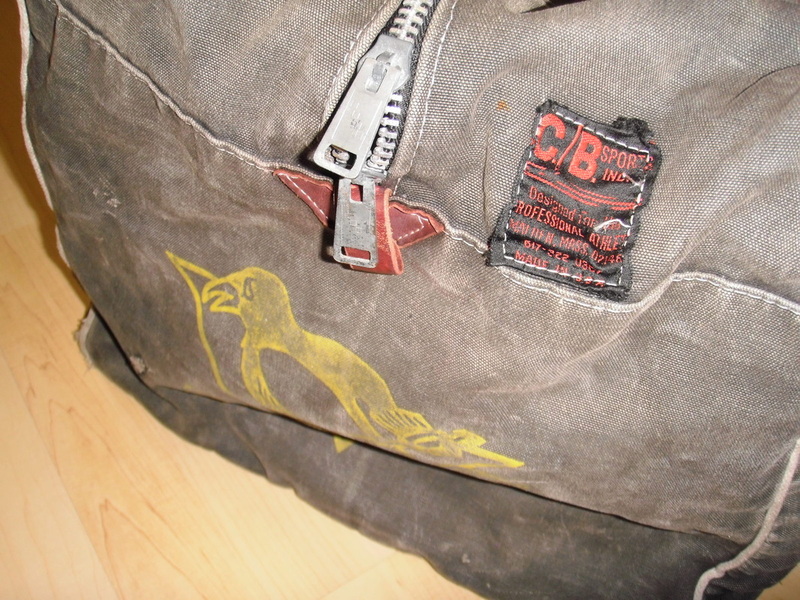 A neat old bag that shows evidence of it's adventures on the road in the form of many cuts, scrapes, and sewn repairs. 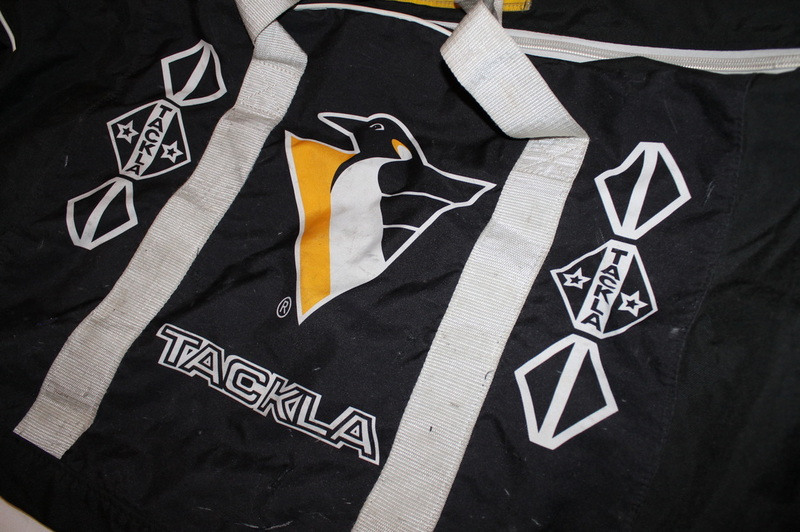 It could have belonged to any number of Penguins but I recall Martin Straka wearing Tackla gear around this time. 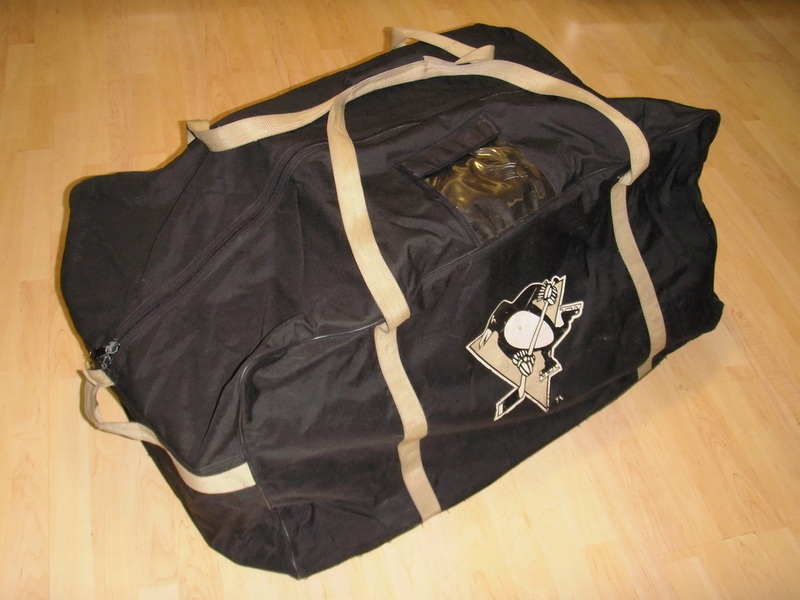 Not saying this is Marty's bag, but who knows...it could have been. That's kind of what makes it cool and interesting. 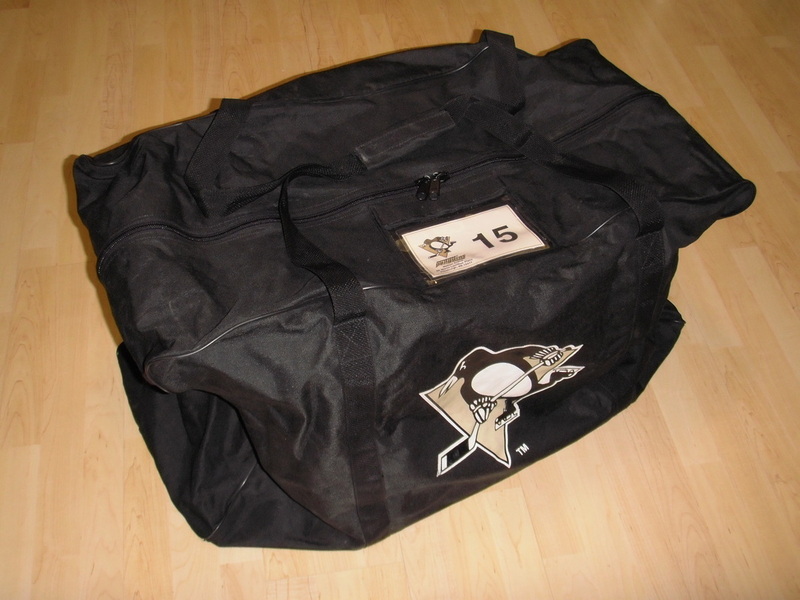 This bag came from Joe Toman who got it as a carrier for a set of jerseys he bought from the team back at the end of the 2005-06 season. The story goes when it came time to pick the jerseys up he needed something to transport them in. The Pens equipment staff had this bag sitting around that still had some of Ziggy Palffy's personal effects in it, so they simply dumped Palffy's personal items into a shopping bag and gave Joe this equipment bag as a means for him to transport the set of game jerseys back home. 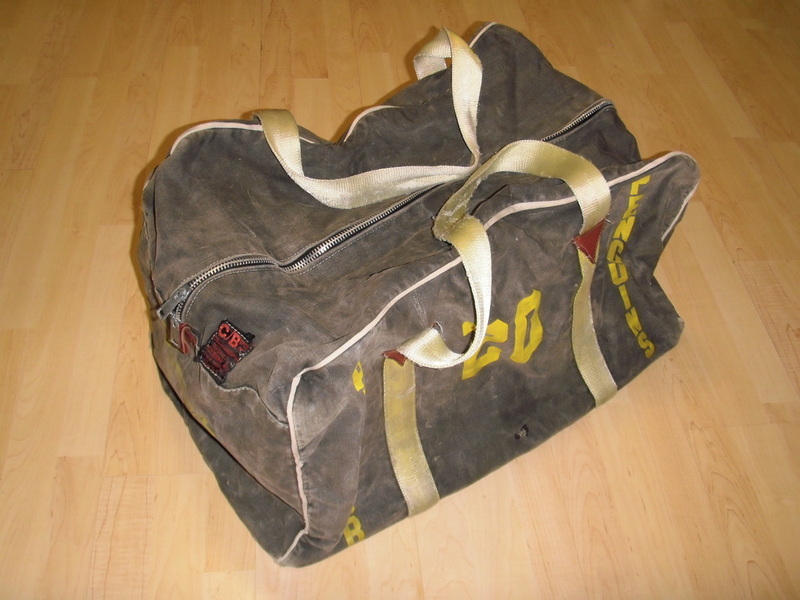 I was able to purchase the empty bag from Joe and include it as part of my ever growing team equipment bag collection. 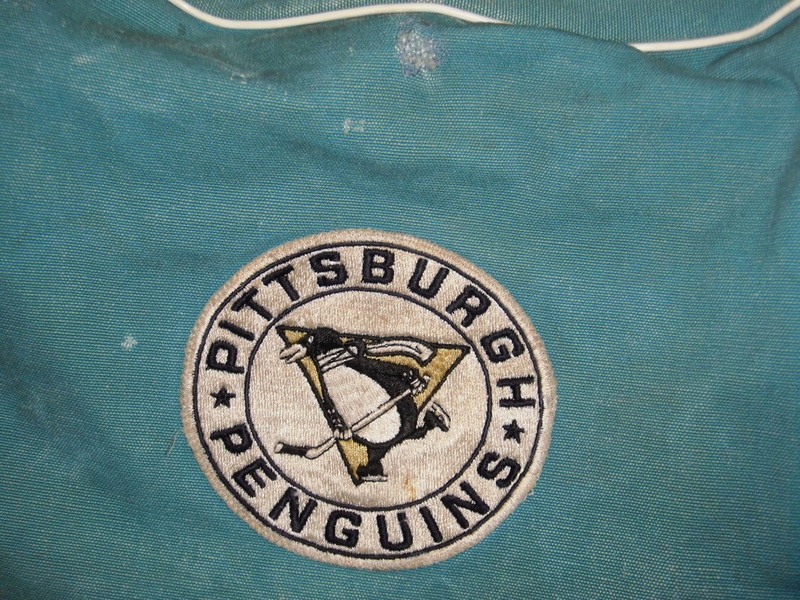 This one shows nice use with some flaking of the Penguin logos on the side as well as some minor cuts and tears from abuse it surely saw during it's many trips on the road. This one is big enough for a goalie. 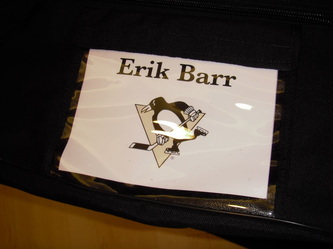 Has player ID card window with velcro flap on top and double zippers that allow it to be opened from either direction. Has a rubber reinforced bottom and contrasting gold carry straps including a loading loop on each end. 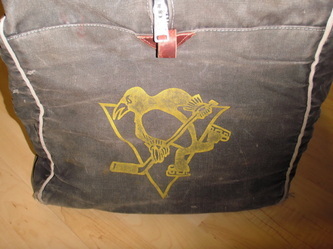 A large silkscreened skating Penguin logo adorns both sides of the bag. Functional and attractive. 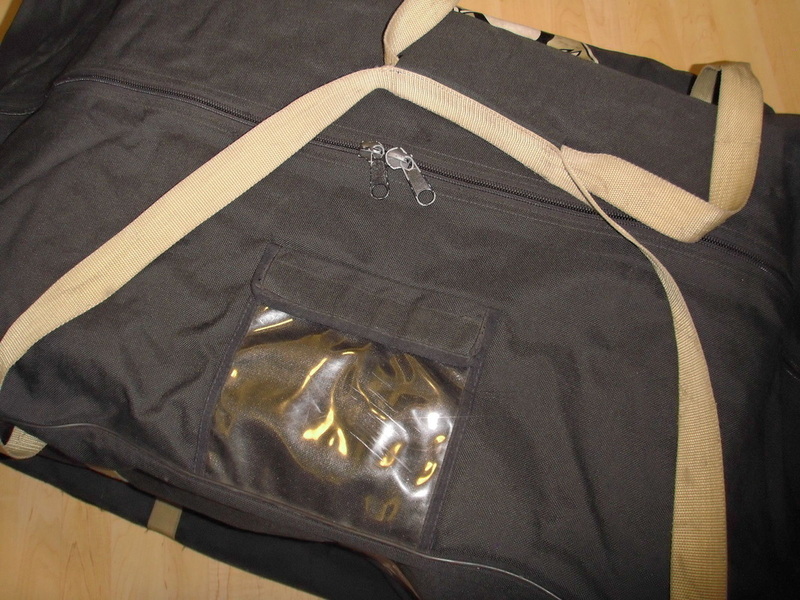 This is an unused team bag, made of modern lighter weight canvas with a weatherproof rubberized inner coating. A very large bag by most team issued bag standards. 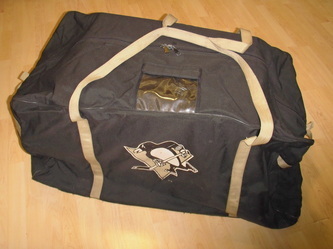 Has the modern Las Vegas gold skating penguin logos silkscreened on both sides and a velcro name/number card slot on the top. 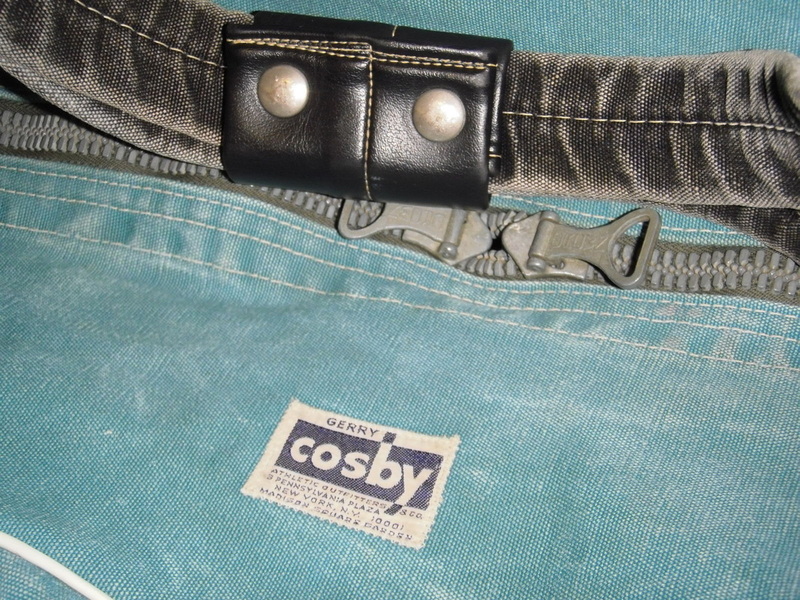 A tiny Canadian flag on the seam piping is the only indication of origin, which leaves me unsure of the actual brand. Being this is a mint and unused bag, I simply added my own Penguins name card for display purposes. 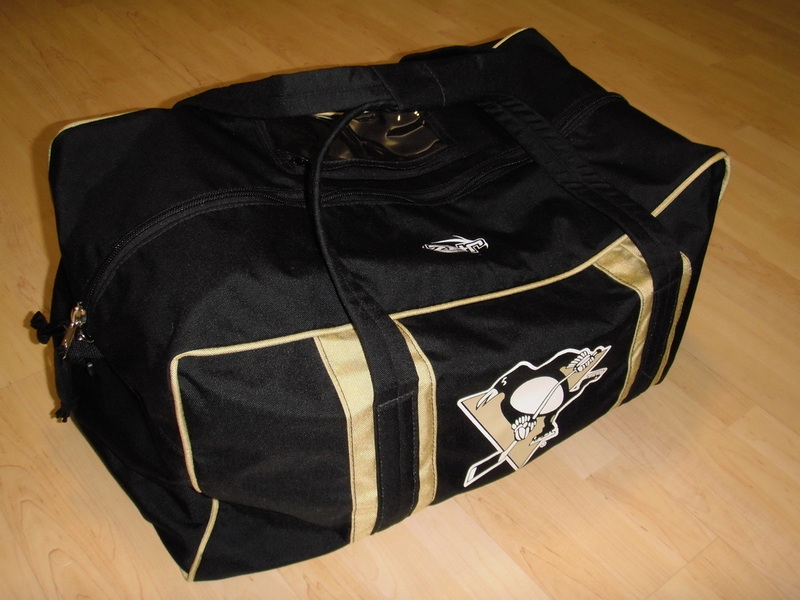 This heavyweight canvas bag has a thick rubber reinforced bottom to help protect it from cuts and abrasions from skates, and the numerous trips on and off the team plane, bus, truck to the practice facility, and so on. 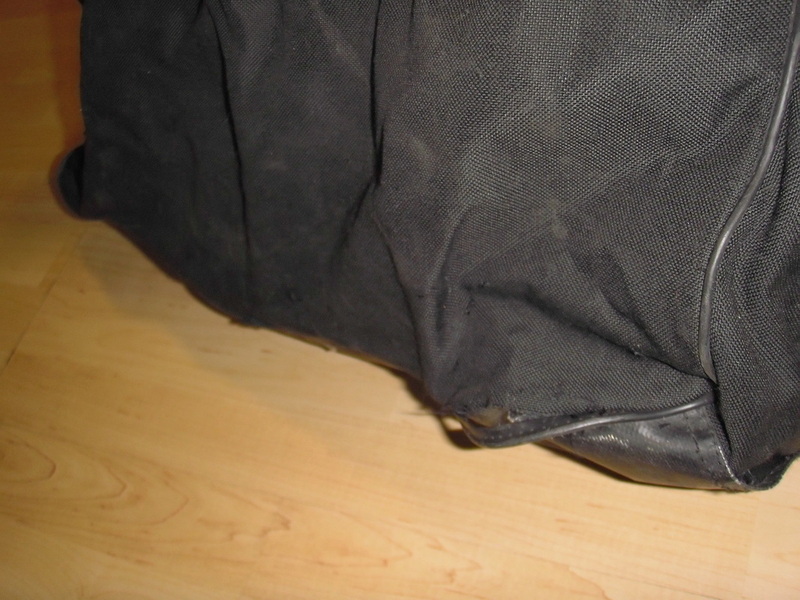 This is a nice big bag that measures 34" long, 22" tall, and 14 1/2" wide, so it can swallow up a lot of gear. 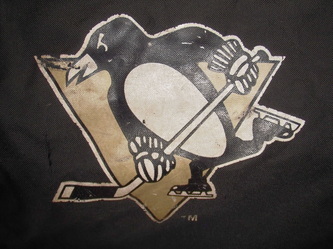 Modern skating Penguin crests are screened boldy on opposing sides. Velcro handle wrap keeps the straps together when carrying that heavy wet gear. Vinyl window on top displays interchangeable player # card. 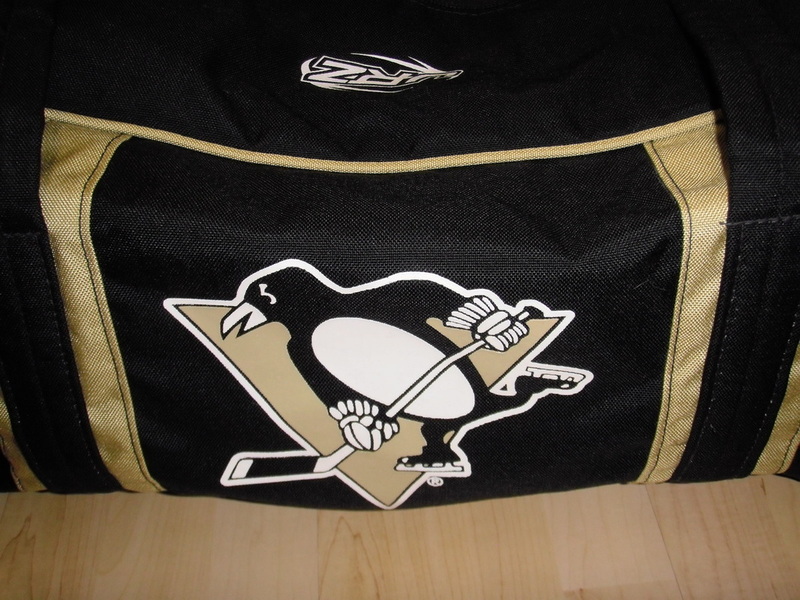 My brother got me this bag as a Christmas present from Ziggy's in Johnstown, who is a sort of trickle down wholesaler for the Penguins. It's a JRZ brand Pens team issued bag, made of thick canvas/nylon with heavy duty self correcting double YKK zippers with pulls. Measures 36" x 17" x 19 3/4" and is plenty big enough to swallow up shoulder pads, gloves, a helmet, and the rest of a pro player's personal effects. 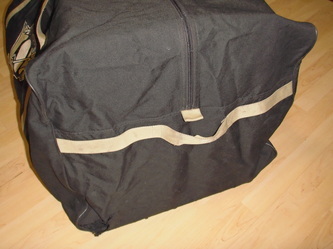 This one is reinforced on the bottom and has super tough triple stitched handles with a snap over wrap. Came with the original clip on shoulder strap inside the bag as well. 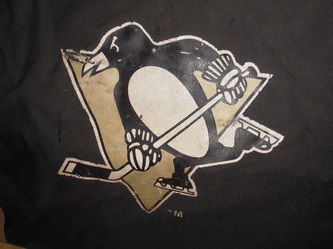 Silkscreened Penguins crest on opposing sides. 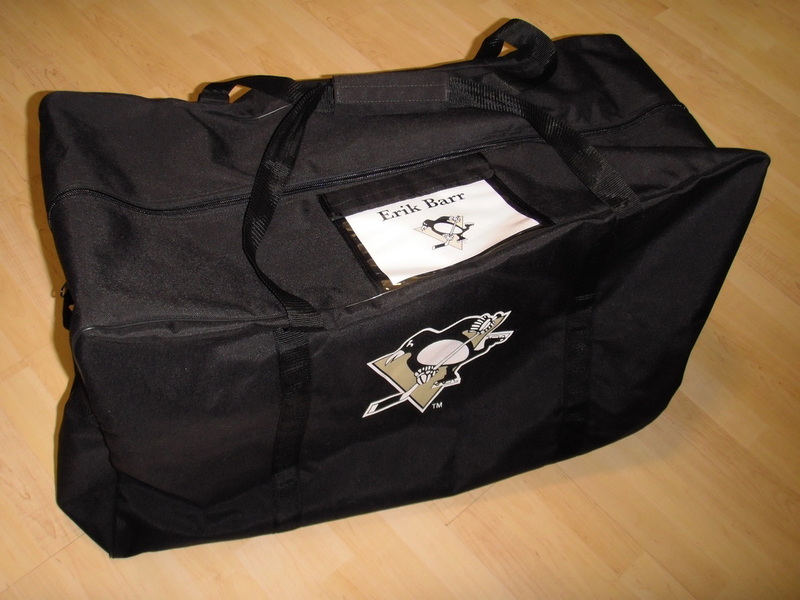 You'll see this style bag repeatedly in the HBO 24/7 Penguins-Capitals series. 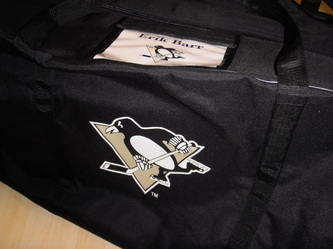 This bag is first class all the way, much like the current Penguins roster and front office staff. 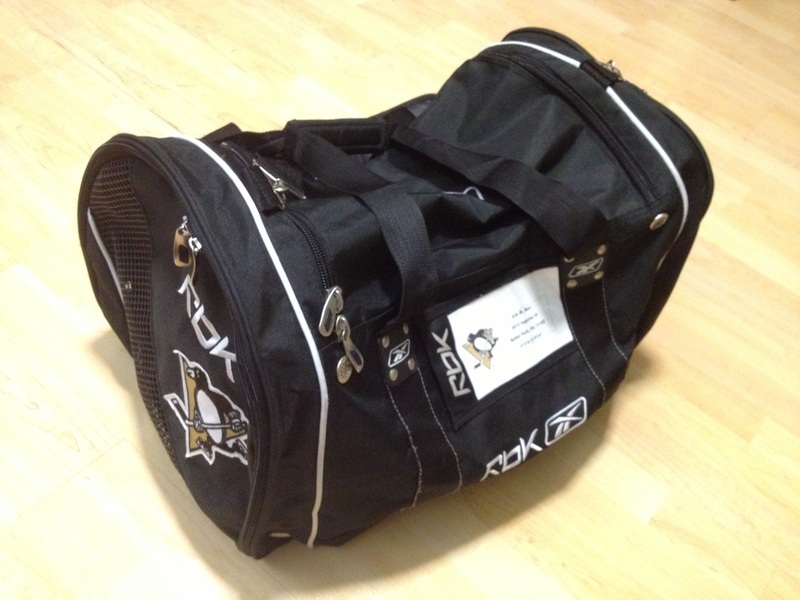 This is the same bag Sidney Crosby & Co. uses on each and every road trip and practice session. JRZ Canada was founded by Mr. Jean-René Lavigueur in January of 1993 at the young age of 19 in the basement of the family home. From one employee that mainly repaired goalie equipment and repalmed gloves in 1995, to 6 employees in 1999, JRZ Canada has now grown to employ about 20 people full time. 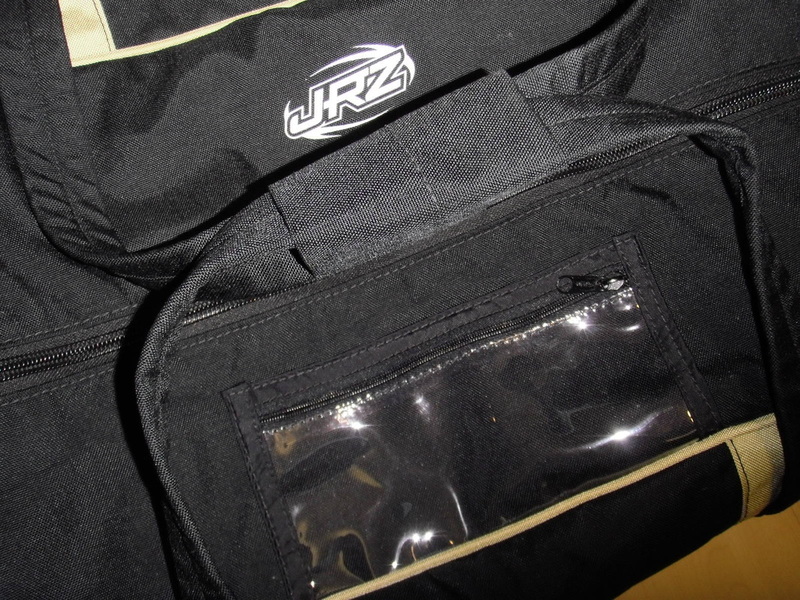 JRZ holds an impressive 25% of the international marketshare in hockey bags for professional clubs among many larger competitors. It's obvious that their product is top shelf and doesn't compromise quality for cost savings. 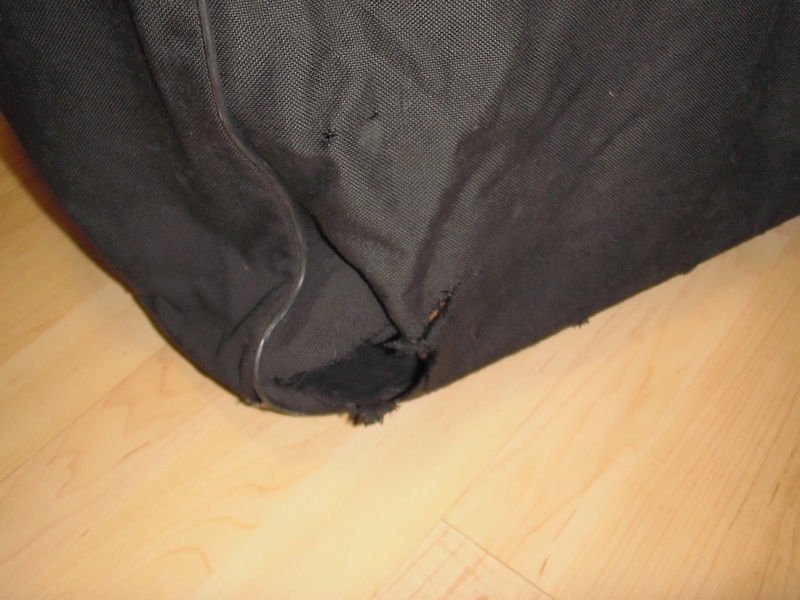 This bag seems like it built to last several seasons for sure. 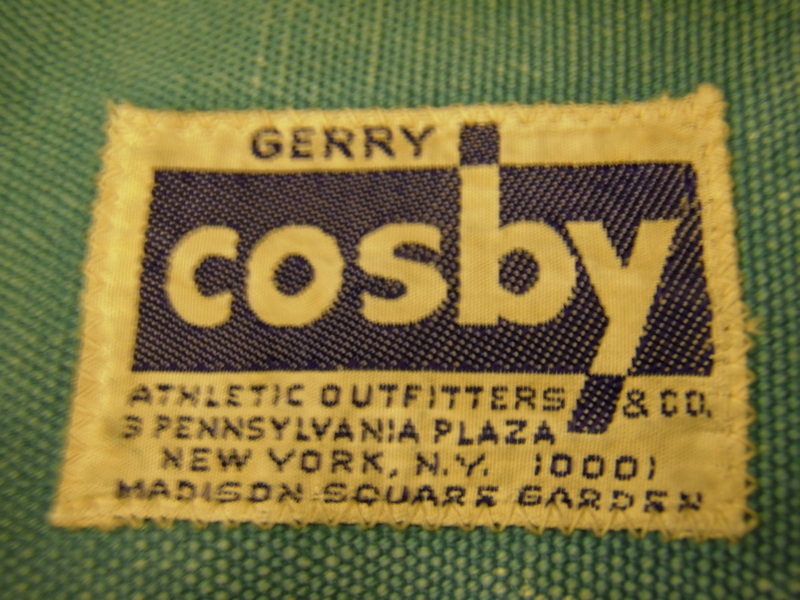 Player namecard zippers into a vinyl display window on the top of the bag. 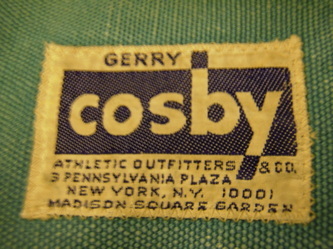 Here I've added my own name for display and website plug purposes when I carry the bag to jersey expos. I got this one from a Canadian seller who was friend's with an unnamed tryout for the Pens during the start of the 08-09 season. He was issued this bag but didn't make the team. Both ends are vented and designed to carry skates. The inner lining is separated from the outer nylon at each stress point under the strap, from carrying it full with wet shoulder pads and skates. I got this one very reasonably and like to use it myself if I'm going away for a weekend or need a trade bag to carry along to an expo. The bag has Penguins crests, that appear to be the same kind worn on the shoulders of all star jerseys sewn to each end, presumably by Pens equipment man Dana Heinze. 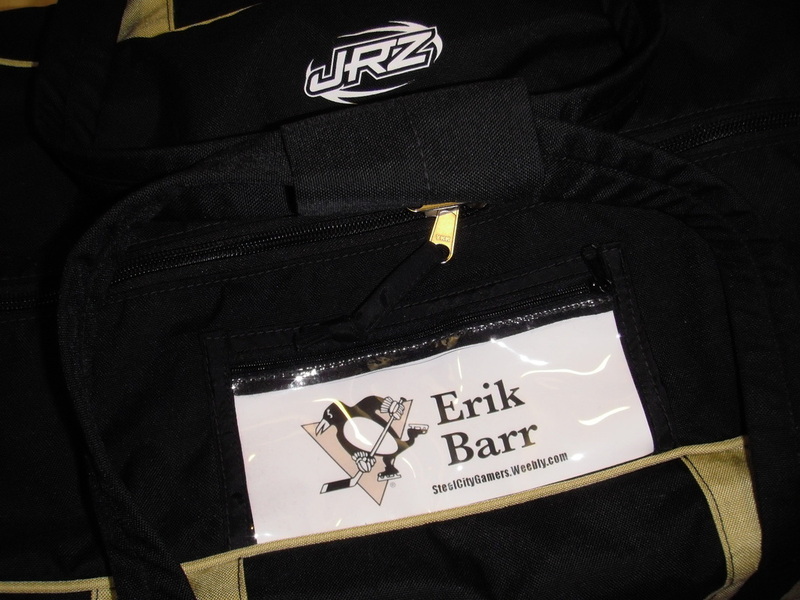 The long side of the bag also has a clear pocket for player identification to which I've added my own nametag. I find it interesting that it's from the Pens' 3rd Stanley Cup winning season, albeit from a fellow who came just short of making his dream of making the big leagues that year.